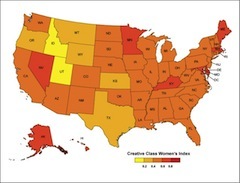 DC is a great place to live and work, we’ve said as much for years, but now The Atlantic Cities’ Richard Florida has some news for working women and creative class women in specific: DC is the Tops. Those women working in the creative field are experiencing wage growth in the District, and District women get approximately a $20,000 premium for their location here in the District. The new isn’t all good, though, on average, men still out-earn women in the workforce by over $10,000, and that margin doubles when you move into the creative class. Still, it is good to see that the District has a strong creative class showing here.